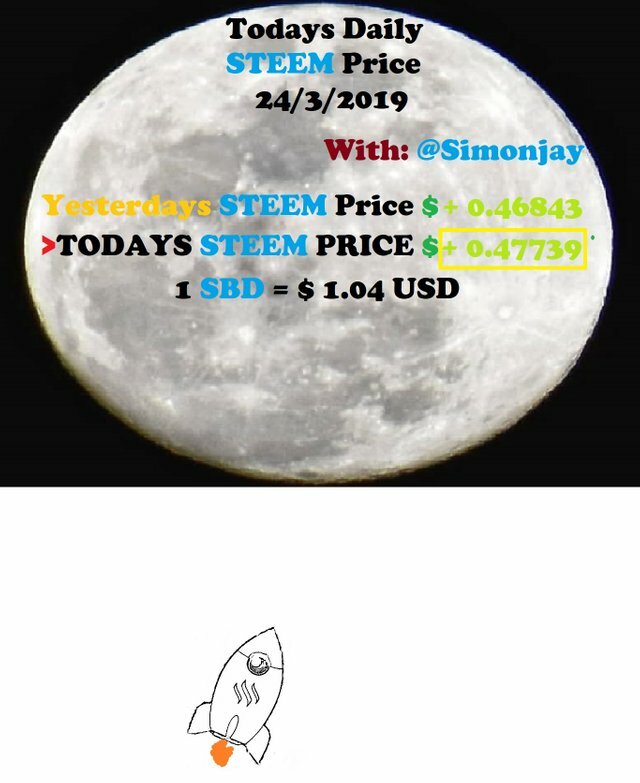 Good day Steemian welcome to today's Steem price update for 24/3/2019 I have been posting the Steem price update since almost the very beginning of Steemit.com many have came here to discuss the daily Steem price's and changes for just over 2 years now. 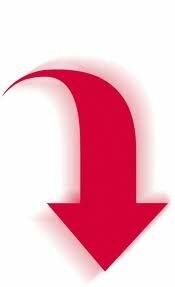 I also want to mention just incase your wondering when perhaps something doesn't seem normal from the other regular Price update posts that the daily Steem price posts do occasionally change it's format from time to time. Should you be trading with Steem today...? 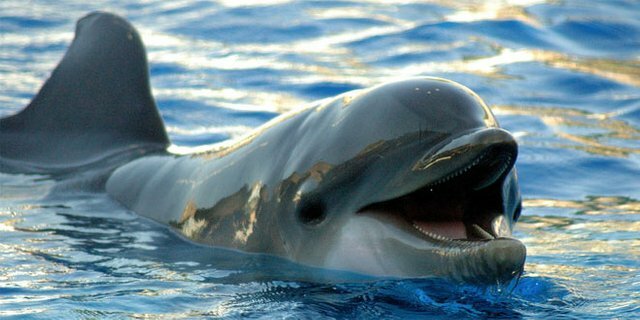 If you didn't catch my announcement post I want to thank you, and everybody else who have gave their extra support on getting us to dolphin, YES we have finally achieved this after 30 months! A big thank you and I'm sure once the price goes up it will be more helpful to us all. If you still got any extra support or power left then let us kick-off this new dolphin powered ship with a great boost! 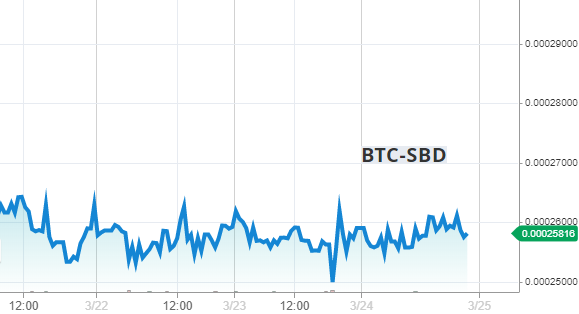 And so this March 10th we have seen Steem reach $0.55 along with SBD's which also had another record in March 13th marking it the highest reached SBD's at $1.41 for 2019. With Bitcoins since 7 days ago it's been mostly bouncing between being above and just below the $4000 mark. As you know we beat the January high reaching $0.55. While we have been mostly above $0.45 lately we are already in a good place, Steem as been seen around position #40 amongst all the other cryptos. The last 2 days Steem as been mostly solid on $0.46 today we saw some movement in the right direction if your not a buyer. Steem started where we left it yesterday which is of course $0.46 it stayed there until ⏰09.00 here Steem upbumped to $0.47 but it was only brief giving the impression we would most likely be staying at $0.46. But our return to $0.46 was just as brief and we rose back to $0.47 again at ⏰09.35. We stayed at $0.47 till ⏰12.30 Steem rose-up to $0.48, and no it didn't stay there for the remainder of the day it jumped between $0.47 and $0.48. Anyway if not too much happens in 2019 then I hope those who are still in the game will take the opportunity to keep collecting Steem. No longer in survival mode the conclusion from all this is to continue cutting of the costs of nodes. Hivemind is now live the "steemd" instance size's went from 488GB RAM to now shockingly 61GB RAM! Focus is on a multi index RocksDB adapter which is a new technology in development to allow the Steem blockchain nodes to store almost all of it's necessary data to a disk in a modern database instead of RAM, this move will make nodes cheaper. Ned also said that the cost reduction progress will still remain above the creation of SMT's which I feel is the right move. Did you know that after the wallet split from steemit.com is complete that both logged in and non-logged in users will see the adds on Steemit.com, I would rather not but understand this is part of keeping us out of survival mode if it was to happen again. Steem is also available for trading on the Huobi marketplace so if you are a U.S. resident just go to huobi.com, if you are anywhere else you could try Huobi global at hbg.com. Also if you still don't understand how your private keys work or are relatively new to Steemit you can go to the Steemitblog account for a more recent official explanation. For SBD's they broke record March 13th reaching $1.41. Currently SBD's are at a "slightly higher" pegged rate, which still happened early today but not as expected it stayed most of the early hours between $1.03 and $1.02 it was not until ⏰09.05 that we started to see mostly $1.04. We also had a small moment around ⏰13.30 hitting $1.05. Always do your own due diligence the above is only a opinion. So if you like this page I need you guys to do me 2 easy things. 1.First please upvote this page. 2.And secondly dont forget to follow me below. Also since votes don't always = $ and you if want to see more you can send me Steem Power Tips to @simonjay to help support me. @paradise-found - @karenb54 - @koskl - @hanshotfirst - @meesterboom - @mammasitta - @akomoajong - @yusril-xabre - @surpassinggoogle - @whatisnew - @kristy1 have already done this so a big thank you to them all! Good afternoon @jkenny on the day the last 2 previous days Steem was mostly solid on $0.46 but with this update we saw some movement in the right direction. Regardless of not much change the water's are definitely nicer here, but I think with a price rise it will be a fantastic place to be @manorvillemike, and if we don't get there in the meantime I wont stop from improving what this account can give back. Haha messing around at $4000 is the right words it's been playing a game for around 2 weeks now, yet I keep hearing people are sure it's going to go downward at some point. You got more than 5000 replies. Your next target is to reach 5250 replies. Your UA account score is currently 4.635 which ranks you at #1728 across all Steem accounts. Your rank has improved 1 places in the last three days (old rank 1729). 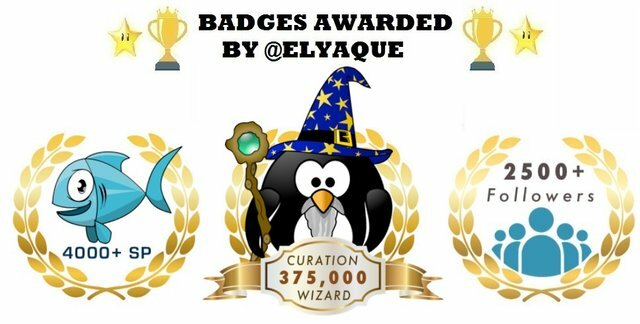 In our last Algorithmic Curation Round, consisting of 221 contributions, your post is ranked at #133.